A few of us from the band were at Big and Brassy this weekend just gone. This is a community band event, featuring players from 8 local non-contesting bands including Camberley. On Saturday we had a whole-day rehearsal, with another short rehearsal on Sunday morning and a concert in the early afternoon. The guest soloist was Alan Fernie, the excellent trombone player and composer/arranger – we enjoyed several of his compositions and arrangements, as well as his solos! The conductor was Paul Speed, well know trumpeter, composer, arranger and conductor. It was a hugely enjoyable weekend and was a great concert in the end. I also learnt quite a bit about conducting just by watching Paul, and I’m hoping to find out a bit more about composing as well. Apparently there will be another one next year so keep the last weekend in March free! It’s that time of year again! Barely a week has gone by since Remembrance Sunday and the band has already completed its first Christmas gig. Unlike when I used to play with Martlesham Brass when I was growing up, and our first Christmas carolling was on the chilly chilly streets of Aldeburgh on the Suffolk coast in the first weekend in November(!!! ), it’s now becoming an annual occurence for Camberley’s season to start in the warm! We always enjoy a relaxed and very friendly evening with Longacres Garden Centre, Bagshot, as they open their Christmas store on a Thursday night. My wife and I snuck in a tasty dinner from their Cafe before we played an hour of enjoyable carols, rarely straying from the good old Red Carol Books, as they are universally known! We look forward to the rest of our Christmas gigs this year, some of which will also be in the warm but some chilly ones outside too! Goehr had a long academic career, most notably over 20 years at Cambridge’s music department, teaching a number of leading composers. But it was his comments on composition that really stood out. If you’re in the UK, you can listen to the full episode in which he discusses his teaching here (until 13th October). Outside the UK and probably for longer, you can hear just the discussions in this episode of the Composer of the Week podcast. I was interested in his comments because recently I had set the Camberley training band some exercises, among them some initial compositional exercises of inventing a melody to accompany some chords. Goehr’s initial comments on teaching composition really stood out; when asked how to teach a composer, he simply said, “I don’t know how you teach composition; there’s no systematic way. Some people say it can’t be taught” – this from a Cambridge professor of music! But I think his insight is very useful and accurate, when trying to encourage musical people to compose. I think that teaching composition is a very short-term procedure; it’s very immediate. Somebody comes, and you either make a communication with them, or not. And I don’t think composition teaching, in my experience, should last longer than about three months; that’s enough. You either get the point immediately, or you’ll never get the point. The systematic aspects of composition teaching: Richard Hall used to say “Keeping the front of the brain busy while the back of the brain is doing it’s stuff”, it’s not discussable; it’s either more traditional or less traditional or according to the individual teacher. But how do you develop a composer when they are just starting? Certainly if your work is often performed, then you have a barometer for the success of an individual piece. Paintings are sold or they are not; how do you judge the reception to a piece commissioned by a band and only ever played by them? Goehr indicates that he has no better knowledge of whether a specific composition is good or not than his students, but he tries to make productive comments – and they are either useful, or they are not. After that it’s a question of drinking coffee together and encouraging people, and being nice – you know. But the actual business – they bring a piece, or you set them a piece, suggest something they might write; and then when they bring it, you don’t know any more than they do what’s good or bad. But you say something, and it’s like throwing a ball in the air: and they either respond to that and they get something from it, or they don’t. And there’s no way of guaranteeing it. I often felt my pupils were better than I was. It’s been another wonderful summer for Camberley and District Silver Band, performing across a number of bandstands and other engagements, in mostly good weather! Aldershot and Guildford Castle provided excellent weather for enjoyable afternoons out with the crowds. Guildford was especially successful as we entertained (and only occasionally put off) the bowls players just behind the bandstand. We also returned to Church Crookham for their annual village fete and were baked in the glorious sunshine, to the point where the Official Band Mascot, Eddie the Greyhound, was forced to retire to the shade behind the book stall. The band overcame tricky prevailing conditions (an afternoon-long torrential downpour), with the assistance of a couple of borrowed gazebos, to just about survive the Cedar Lodge Nursing Home summer fete. Despite the deluge the performance was enjoyed by all residents, who spontaneously burst into accompaniment clapping during our newly-acquired (and excellent) arrangement of Shine Jesus Shine by Paul Benyon of Martlesham Brass. For this summer’s programme I dug into the band’s extensive music archives to pull out some new work; Shine Jesus Shine was an excellent hit, but I think Sussex By The Sea won’t survive much longer in the folders. When I was searching for some different marches to sprinkle through our programmes I discovered we have quite the Kenneth J. Alford collection (some say he is the Sousa of England) and so some of those have had an airing and more to come. to our newsletter if you want a reminder. Before we move on to our traditional winter programme of Remembrance Sunday and Christmas carols, there are two dates for your diaries that you really do want to keep free! 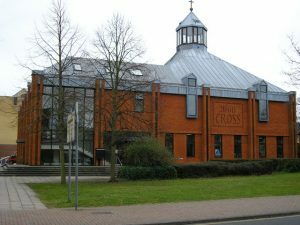 First of all, the band returns to High Cross Church in Camberley for our hugely popular annual concert. Tickets aren’t available just at the moment but be sure to keep 14th October 2017 free! Find out more and subscribe for updates here. 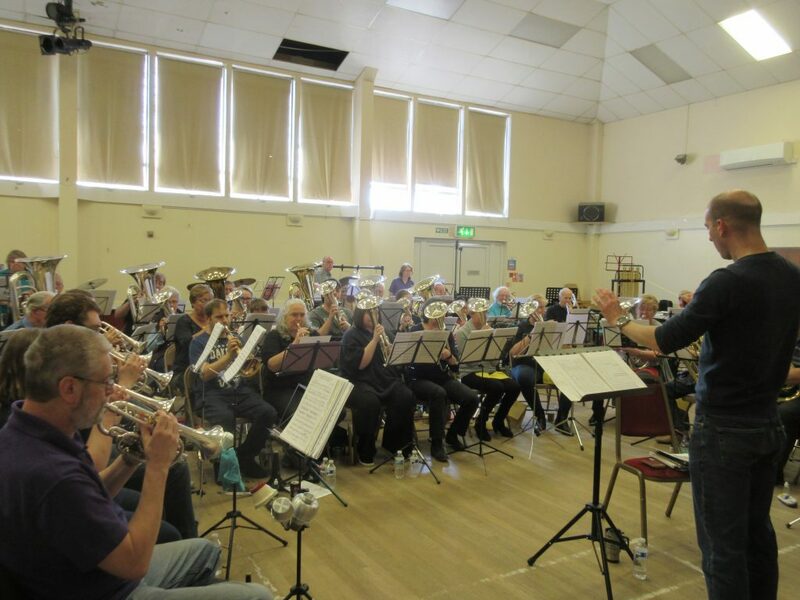 After a very popular first year, Big and Brassy, the joint concert among local non-contesting brass bands, returns to Princes Hall Aldershot on 15th April 2018. Again tickets aren’t yet available but full details will be coming soon. Finally, if you’re already signed up to our newsletter, you can also keep up with the band by following us on Twitter and liking us on Facebook. Following some great hard work by the committee, I am pleased to be able to show you the new logo for Camberley and District Silver Band! The idea behind the design was to create a fun, almost light hearted look to the design, without it feeling childish or cartoony. We avoided the more traditional or script fonts and opted for a bolder typeface which is simple and easy to read without being too corporate and cold. Utilising the band colours of gold, teal and black, the end result is a well balanced and compact logo which will work well for a wide range of purposes. And we love it! Look out for the logo making an appearance around Surrey, Berkshire and Hampshire over the summer. And if you want your own logo, go check out Embrya studio’s site. Last night the band hosted our Supper Concert at Crowthorne Methodist Church, and I am pleased to report that thanks to the hard work of the band members and our willing assistants, it was a big success! Visitors from far and wide came to hear a hugely varied performance of “light entertainment” music, ranging from modern pieces and arrangements through to older and well-loved music. I am building a bit of a reputation for digging out interesting stories about the pieces of music we are playing (even if the links from one to the other are a bit tenuous at times) – as well as going on a bit in between pieces! 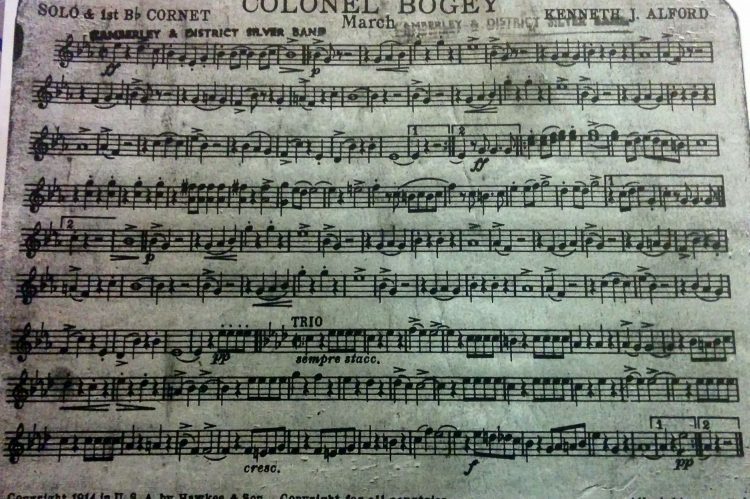 But there is one story I didn’t get to share last night which I would like to share now is about our opening piece of the evening, Alford’s Colonel Bogey march. Here’s the “conductor’s score” for the march – if you look carefully it is old enough to have been stamped with the band’s original name, before we changed it back! But there is another story, which is of how the piece got its title – and it’s all to do with golf! When golf was just starting out as a sport, it is said that one player would whistle in two pitches rather than shouting “fore” – going down a minor third. 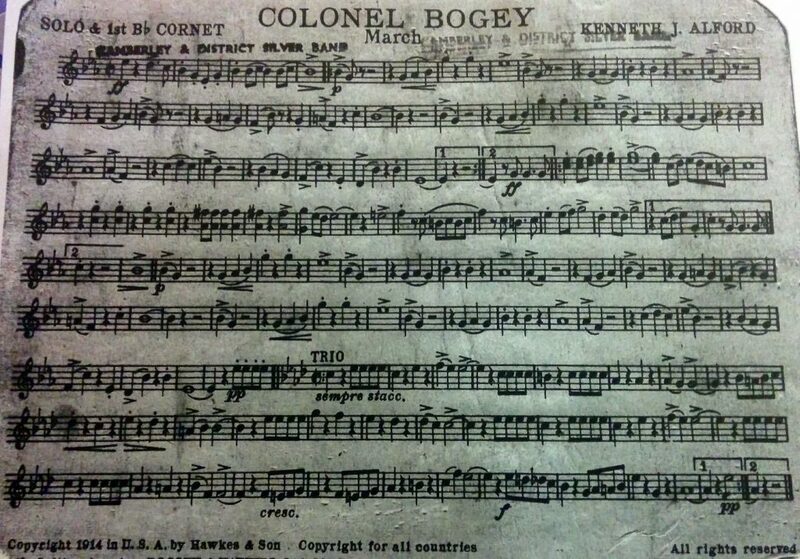 This is the first two notes of each phrase of the Colonel Bogey march. But what about the dear Colonel himself? According to golf lore, he never actually existed as a real person! In Coventry in the early stages of the game’s popularity, instead of scoring against the people in their own group, golfers came up with the idea of scoring against a mysteriously consistent and average player. The concept of “par” had just been invented, and so this imaginary player was said to score a “bogey”, or one over par, on each hole of the course – hence their consistently average performance. But the Coventry players, who were all men in the military, insisted that the imaginary player have a military rank just as all of the other members of the club did. And for someone who played so much golf, they must be very important – hence the assigned rank of Colonel, and the birth of Colonel Bogey! Wenni and I were also on (very briefly!) the Peachy Quest programme of BBC Radio Berkshire just before 11am on the concert day. Sadly they didn’t complete their quest and make it to the venue in time, but they did come and say hello and put a video and photo up online. We are not even at the end of November yet and I am pleased to report we have completed our first Christmas carolling engagement! Thank you to everyone who came and said “hi” while we performed at Longacres in Bagshot last Thursday. Talking of an early Christmas, I must confess in my banding experience this is not an early start. I remember playing with Martlesham Brass when I was younger at Aldeburgh for their Christmas lights switch-on – always the first weekend in November, and once on November 1st! I don’t know if you’ve been to Suffolk’s North Sea cost in early November, but I think “chilly” and “draughty” are both understatements! Camberley has three more carolling gigs before December 25th – see if you can spot us at The Meadows on 9th December (5-9pm), The Wellington Centre on 10th December (10.30am – 12.30pm) or Hart Shopping Centre on 17th December (10.30am – 12.30pm). It has, once again, been a busy summer for the band, with 8 bandstands / fetes / concerts performed in June – early September. 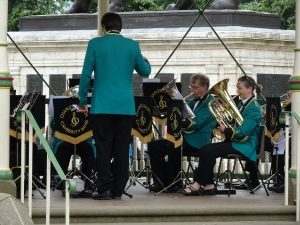 Preparing bandstand programmes is always a little tricky: you want a good balance of the fast and the slow; some traditional brass band music for the regulars and some more modern tunes for the passers-by; and something that the band enjoys too. And you have to get the right amount of music too, something I found notoriously tricky to begin with! From the first bandstand where I overcooked it and needed a couple of last-minute cuts, to the next where I way overshot on the correction and had to go folder-fishing for something else to add in… but we got there in the end. Things quieten down a bit for the band – in terms of performances – for a couple of months now. That doesn’t mean that we won’t be keeping busy rehearsing though, as after our busy Remembrance Sunday we have a concert at High Cross Church for which we are busy preparing and rehearsing an extremely exciting programme. You can find out more about that concert here. As you may have noticed, we have a new website up and running – so keep checking back for the latest updates. If you want to be e-mailed whenever we release new concert tickets you can sign up to our newsletter here.